ÅF has designed the technical installations in a supersized underground parking garage, which has just received a prestigious Stockholm building industry award. With 47 000 square metres and some 1000 parking spaces, the Bergrumsgaraget underground parking garage is the largest one in Sweden. Previously, the space served as storage for alcohol merchants Vin & Sprit AB. 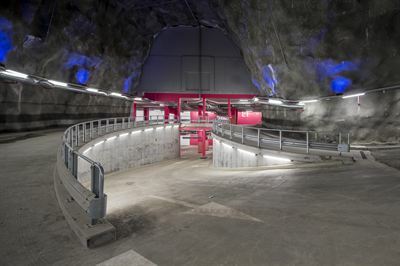 The caverns are situated in Årstadal, Stockholm, hollowed out of the rock behind the Liljeholmskajen seafront. Creating a parking garage here enabled the developer, JM, to build an additional 600 new flats in the area. ÅF has delivered system- och bygghandlingar för heating, ventilation and air conditioning, as well as sprinkler and building monitoring systems. Mr Olof Hägg has been in charge of the project from as early as 2003. The ROT award was instigated by the Stockholm Byggmästareförening building industry association, to promote the repurposing of property in Stockholm. This year’s award was presented to the team representing the Bergrumsgaraget project on Friday 27 May in the Stockholm House of Culture. The jury emphasized the impressive size and complexity of the project, and that safety and security had been its watchwords.